My dog, Harry turned 8 this week and we celebrated with a special doggy birthday cake and a little party. The recipe for the cake is here. As with any great party, part of the fun is the recap. Harry was on his best behaviour, and aside from wolfing down his share of the cake in five seconds flat, he didn't embarrass me with any 'Frat Boy' antics. Here he is waiting for the cake. It was Harry's own idea to hop onto one of the chairs. I guess dogs who get birthday cakes don't have to sit on the floor. Harry is wearing the Red Glitter Paw tag. Notice the expression of focus and patience giving way to frantic anticipation. It's the same look he gives the pizza delivery guy. Harry loved the cream cheese frosting. Again, this cake looks good, but the human taste-tester (who prefers to remain anonymous) gagged when she took a bite. The cake was a bit/a lot chewy, which slowed him down a little. We gave Harry a new chew toy at which point he ran inside to enjoy some chewing time - alone. No diva type behaviour from this dog! 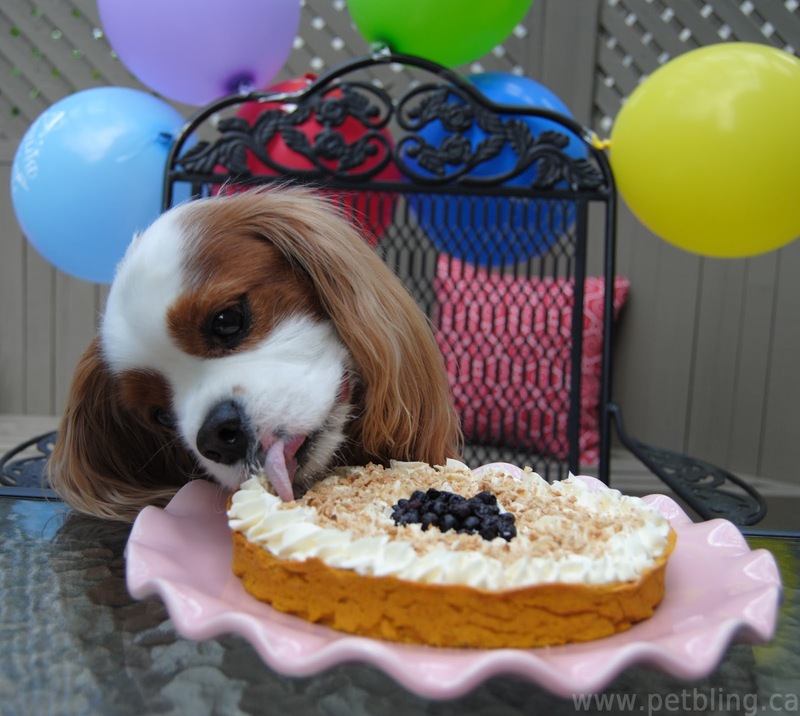 You can read my tips for planning your own dog birthday party here. Visit PetBling.ca's profile on Pinterest. Thanks for visiting - we're glad you're here! 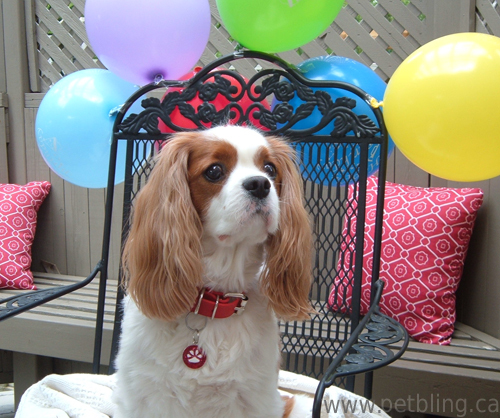 PetBling.ca is a Canadian pet boutique specializing in designer dog id tags. We have a huge selection of pet tags, dog collars and pet accessories! Our dog and cat id tags include free custom engraving and we offer free shipping within Canada on every order. Visit us on Facebook and Twitter to see pictures of happy customers, new products, announcements and special offers!